We’d love your help. 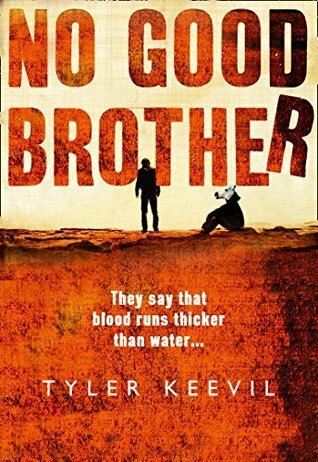 Let us know what’s wrong with this preview of No Good Brother by Tyler Keevil. Tim Harding has spent the fishing season in Canada working as a deckhand, making an honest living. To ask other readers questions about No Good Brother, please sign up. Tim Harding is a deckhand working out of Canada - it's the end of the fishing season and he's looking forward to some downtime - that is until his brother Jake turns up. Jake insists that Tim meets him that very night, and tells him that it has to be tonight or not at all. Jake's a hothead, an ex-con, who drifts from one disaster to another, and the death of their sister Sandra some years ago has also coloured the way he looks at life, and dictates his behaviour to a great extent. Sandra was kil Tim Harding is a deckhand working out of Canada - it's the end of the fishing season and he's looking forward to some downtime - that is until his brother Jake turns up. Jake insists that Tim meets him that very night, and tells him that it has to be tonight or not at all. Jake's a hothead, an ex-con, who drifts from one disaster to another, and the death of their sister Sandra some years ago has also coloured the way he looks at life, and dictates his behaviour to a great extent. Sandra was killed by a drunk driver, and neither Jake nor Tim have really come to terms with it. When Tim meets Jake that night, he discovers that Jake has got himself involved with some gangsters known as the Delaney brothers, and he 'owes' them! To repay his debt he's agreed to steal a racehorse from a rival set of gangsters, the problem being, he needs Tim's help to have any chance of succeeding. What follows is a journey by land and sea, that is both farcical, humorous, and yes, even moving at times. With customs officials in pursuit, and horrendous weather at sea to overcome, it's a roller coaster of a ride to deliver this beautiful animal to the Delaney's ranch in the US. This was an unusual storyline, with some gritty down to earth characters. Tim and Jake both have their faults, and at times their frustration and anger means things get physical, and it results in them coming to blows, but the message at the end of it all is that family is everything, that allowances can be made because when it comes right down to it, love trumps everything. Your brother walks up to you and says “I’m in a terrible spot with some really bad people. Will you help me?” You say “Is this illegal?” and your brother says “Yes, but if we don’t do it, they’ll kill me.” What do you do? Are loyalty and brotherhood more important than lawfulness? I suppose it also depends on what the request is, and who’s asking? Tyler Keevil has written a really skilful and entertaining book that weaves suspense, sharp dialogues and some very hilarious situations into this novel, to explore that conundrum. In this book, Jake walks up to Tim and says “I’m in a terrible spot with some really bad people, will you help me?” Tim has a future with his current job (the first one in such as long long time), he’s seen as part of the owner family business and he’s involved in a relationship with their daughter. Of course, he has no real choice, it’s his No Good Brother. The brothers talk, laugh and fight, and it is very clear that their underlying relationship is very strong, especially as past family incidents bolster their closeness, such as the loss of their sister, and their Mum recovering from a stroke and requires constant care. Tyler does a great job creating that dynamic between siblings, their underlying closeness and the bonds that exist. Jake has spent time in jail, and while incarcerated received favours from the Delaney Brothers' gang. Now comes the payback, and he must steal a racehorse in Canada and deliver it to the Delaney ranch in the United States. As if that’s not enough they are stealing the horse from the Triads. Tim and Jake, have no experience in smuggling across borders, and absolutely none with respect to horses and how they are handled. Their lack of horse knowledge is hilariously crafted in a scene where they first encounter the racehorse Shenzao and need to get it into the van. To crown it all off, it’s caught on CCTV and goes viral. Racehorses are treated with utmost care and what starts the journey as a highly groomed prima donna horse, ends as a bedraggled mare. It is really engrossing and entertaining following the brothers through their journey and across an international border. Shenzao hasn’t finished upsetting their plans as it is unbelievably difficult to keep a horse quiet while stuck inside a van or boat. It’s also not without its murder and violence to add to the drama and suspense. A wonderful read that I’d happily recommend to those that love a crime thriller mixed with humour and the importance of love and loyalty. Tim Harding has spent the fishing season in Canada working as a deckhand, making an honest living. His hot headed younger brother tracks him down at the shipyards in Vancouver. Tim senses trouble. Jake is a drifter, a dreamer, an ex-con, and now he needs help in repaying a debt to the notorious Delaney gang. We learn the brothers have lost their sister, Sandy, to a drunk driver. The consequences of her death casts a shadow on her brothers lives. Jake owes a debt to the Delaney brothers and persua Tim Harding has spent the fishing season in Canada working as a deckhand, making an honest living. His hot headed younger brother tracks him down at the shipyards in Vancouver. Tim senses trouble. Jake is a drifter, a dreamer, an ex-con, and now he needs help in repaying a debt to the notorious Delaney gang. We learn the brothers have lost their sister, Sandy, to a drunk driver. The consequences of her death casts a shadow on her brothers lives. Jake owes a debt to the Delaney brothers and persuades Tim to help him. Here the adventure begins as they travel across land and sea. This is a gripping, funny and at times heartbreaking read. A tale of family loyalty and love. In brief - This is an easy read which I found enjoyable. Think of the phrase "what could possibly go wrong with this plan" and you'll get a clue about how the brothers' fare in their activities. A solid 4 for me. This is the story of Tim (AKA Poncho) and Jake (AKA Lefty) his "no good brother". Tim has spent the season on a fishing boat in Canada. Jake, ex con, turns up at the shipyard in Vancouver to see his big brother. He doesn't really need help from Tim for anything dishonest honest... The st In brief - This is an easy read which I found enjoyable. Think of the phrase "what could possibly go wrong with this plan" and you'll get a clue about how the brothers' fare in their activities. A solid 4 for me. This is the story of Tim (AKA Poncho) and Jake (AKA Lefty) his "no good brother". Tim has spent the season on a fishing boat in Canada. Jake, ex con, turns up at the shipyard in Vancouver to see his big brother. He doesn't really need help from Tim for anything dishonest honest... The story follows their activities and looks back at their family life. I found this easy reading which made this very easy to get into. The characters had a rich feel almost immediately. The relationship/dialogue between the two brothers - Tim and Jake - felt right. They chat, they laugh, they reminisce and they fight. Their individual stories also bring in their mother and their sister. I grew to like Tim quickly - his brother, though likeable in some ways, is another matter! The humour when it comes can actually feel quite awkward because Tim, partly through his own fault, goes through some difficulties without giving anything away. The boys don't do much wrong but sometimes things just don't work out. I was often irresistibly reminded of the phrase "what could possibly go wrong". We all know the answer to that one! For me this was well written - I quickly found myself completely engaged with the brothers' stories as well as those of the rest of their family, their mother and their sister. There is humour here - dark at times - couple with a lightness of touch to the writing. It is one of those simple stories well told. While I never wanted to stop reading I guess it felt a little long though for the life of me I've no idea what I would leave out. A solid 4 star read to me and I've certainly read something else by this author. The act they are called upon to execute involves the kidnapping of a racehorse and its transfer across the border from Canada to America. It quickly becomes clear that this is a fools errand (the text constantly emphasises that things will not end well) and the exercise quickly turns into a mad caper, bordering on slapstick at times. On a more serious note, the relationship between the brothers is explored in depth and with constant references back to their late sister we gradually learn more about the nature of her death. It’s really all a bit of nonsense but the story is pretty well told and the brothers are an engaging pair. It is hard, though, to take the action seriously and the introduction of a nine-year-old-girl who talks and acts like a mature adult was a step too far for me. Overall I'd say it's a fun romp and for the most part I did enjoy my time with this book. In fact, if you fancy an easy read featuring a couple if likeable guys and a racehorse this might just be the book for you. Sneaking off felt shady and dishonest but those were feelings I generally associated with my brother, and any plan of his which involved me. No human being is alike, even when it comes to siblings and it is so that the older brother Tim gets sucked into Jake’s shenanigans. Since a tragic life-changing moment in the brothers’ lives, their paths went in opposite directions. Tim went and got a job on a boat, Jake went and got himself landed in prison. Now Jake is back and he needs to pay back some favours to the Delaney gang. Tim, being the big brother that he is, naturally wants to help Jake even though I kind of felt there was some serious guilt-tripping involved. The truth is, my loyalty to my brother was so strong that I would have gone along with pretty much any plan, no matter how dumb or foolhardy or crazy, no matter what. Loyalties and laws are broken as the two brothers journey to pay back a debt to the Delaney gang, and as they aim to do just that- pay a debt- Tim and Jake reminisce about their family’s tragic past and discover some unexpected truths which add a new level of risk and fear to the already dangerous situation. I was both attracted and intrigued by this book’s description on NetGalley (my thanks to the publisher for a free copy in exchange for an honest review). It says, "The Coen Brothers meets Patrick deWitt". I am a fan of both The Coen Brothers’ movies and Patrick deWitt’s novels, so that’s two names that will pull me in. But the intrigue comes from the fact that, for me, there isn’t really any difference between the two apart from one being films and the other being books. It’s like saying "water I was both attracted and intrigued by this book’s description on NetGalley (my thanks to the publisher for a free copy in exchange for an honest review). It says, "The Coen Brothers meets Patrick deWitt". I am a fan of both The Coen Brothers’ movies and Patrick deWitt’s novels, so that’s two names that will pull me in. But the intrigue comes from the fact that, for me, there isn’t really any difference between the two apart from one being films and the other being books. It’s like saying "water meets ice": when the two come together, you don’t get anything different, just more of the same! I was intrigued to see if I could spot what what was Coen Brothers and what was deWitt (spoiler alert: I couldn’t, really). No Good Brother tells the story of brothers Tim and Jake Harding. Jake has been in prison and owes a favour to some people he met there. It turns out the favour involves stealing a horse and taking it on a bizarre journey. I am guessing that the deWitt reference comes from The Sisters Brothers which is also about two brothers on a journey. And the bizarre journey has a hint of movies like Fargo or O, Brother Where Art Thou. So, perhaps the comparison makes some kind of sense. The trouble is, from my perspective, it sets the bar very high and the book did not live up to it. It is an established literary technique to give away the ending at the start of the book and then work towards it with the reader knowing what is going to happen. Recently, I read Lullaby which does exactly that. It is a technique that needs to be used carefully, though, because, obviously, it removes one source of tension from the narrative right from the beginning. This book is careful to keep reminding us that it is heading towards a violent ending and it repeatedly warns us that things are going to go wrong along the way. It doesn’t tell us what those things are, but it rapidly becomes clear what kind of book it is, so it becomes relatively simple to guess what is likely to happen. For example, by the time the pair get onto a boat, I found it impossible to think other than that they were going to get caught in a storm and have a near miss with another boat. Both of which they did. It’s that kind of book. When you know what is coming, you need something else to engage you and I didn't find that here because I didn't really get to know the main characters and there wasn't any other source of narrative tension. If this novel is ever made into a movie, it will be called a road movie of sorts. For that’s what No Good Brother is, a road movie of a novel. Tim Harding works as a deckhand on a fishing trawler. Come the end of the fishing season, the crew are washing down the ship and stowing away the equipment when Tim’s brother, Jake, shows up. Jake is an ex con, a drifter, and a dreamer, a man who tends to slide from trouble to trouble. Jake tells Tim that he needs help repaying a debt. Tim senses that no g If this novel is ever made into a movie, it will be called a road movie of sorts. For that’s what No Good Brother is, a road movie of a novel. Tim Harding works as a deckhand on a fishing trawler. Come the end of the fishing season, the crew are washing down the ship and stowing away the equipment when Tim’s brother, Jake, shows up. Jake is an ex con, a drifter, and a dreamer, a man who tends to slide from trouble to trouble. Jake tells Tim that he needs help repaying a debt. Tim senses that no good will come from him agreeing to go along with his brother, but Jake is nothing if not good at manipulating his older brother and tugging on his heart strings. This is especially true because their sister, Sandy, the anchor who held their family together, died in a hit and run a few years back. The loss of Sandy left the brother’s bereft and Tim believes Jake wouldn’t have gone so off the rails if it wasn’t for her death. So it isn’t long before Tim, against his better judgement, agrees to assist. Jake tells Tim the job is just a simple one, that to repay his debt they have to drop something off for the Delaney’s, a violent crime family. Tim reckons on the job being a drug drop or something similar and is alarmed to learn that it is in fact to steal and transport a race horse. What’s more, they have to transport the horse across the international border, from Canada to the United States. So begins a madcap journey across country, the brothers first trying to transport the horse by land, before stealing the boat Jake worked on and transporting it by sea. No Good Brother is a novel of many levels. On the surface, it is a crime novel: the brothers commit a crime, the stealing and transferring of a horse, and there is a gang of violent criminals pulling their strings. On a broader level it is a journey, a tale of two men travelling the ocean. I have zero nautical knowledge, but the author seems to know his stuff; the book is packed with information on how Tim sails the boat and navigates the open sea. This isn’t info dumped, but rather perfectly calculated to the tale, so that the author spins what feels to be an authentic story. There’s a real sense of the environment the brothers find themselves in, a sense of place if you will, the ocean brought to life. But so too is Canada. If like myself readers haven’t visited the country, it’s easy to imagine the picture postcard vision: forests, bears, Mounties and Maple syrup. Here is a grittier Canada of working class men scraping by, dive bars and violence. Finally, and perhaps most importantly, this is a story about relationships. Road movies and their novel counterparts are about personal growth, the characters’ internal journeys mirroring the external, as they learn something important about themselves. No Good Brother is no exception and the brothers, their relationship rocky at the outset, learn some hard truths and gain insights, some not too welcome, into each other and their shared histories. When Tim’s ex-con brother, Jake, turns up asking for his help, he knows it’s not going to be entirely legal. What he’s not expecting is to be roped into stealing a racehorse and smuggling it across the border from Canada to America. What follows is an unpredictable, unforgettable journey, with a shocking discovering awaiting them at the end. I love Tyler Keevil’s writing. His stories are whacky and crazy, but completely believable at the same time. No Good Brother is written from Tim’s perspectiv When Tim’s ex-con brother, Jake, turns up asking for his help, he knows it’s not going to be entirely legal. What he’s not expecting is to be roped into stealing a racehorse and smuggling it across the border from Canada to America. What follows is an unpredictable, unforgettable journey, with a shocking discovering awaiting them at the end. I love Tyler Keevil’s writing. His stories are whacky and crazy, but completely believable at the same time. No Good Brother is written from Tim’s perspective, looking back on events. The pre-emptive elements are really effective because they hint at what is going to happen without giving anything away. I really liked it. The story did feel a little bit long. There were multiple points where I thought it was heading towards an ending, when something else happened to renew the plot. In a way, this was good because it was exciting and kept me on my toes. But on the other hand, I wouldn’t have minded if the book was a bit shorter. The relationship between the brothers is wonderful. They have very little in common and don’t actually seem to get along that well, but they’re family and, after the tragic loss of their sister, that matters to them above all else. They will sacrifice anything for each other and that makes their relationship really special. It’s also entirely understandable. If you’re looking for top quality story-telling, this is the book for you. I struggled with this book at first as it was depressing and bleak at the beginning, as were the lives of Tim and Jake. I don't think I've ever read such a miserable description of Vancouver, but it certainly sets the scene for what ensues. The lives of Tim and Jake have been coloured by the death of theirs sister, Sandy, to a drunk driver. Tim is taciturn, Jake has gone off the rails....but they are brothers, so they help each other. What follows does lighten the tone of the book as we are introduced to Poncho and Lefty, possibly the worst outlaws ever, and their madcap scheme to kidnap a horse as payment for a debt that Jake owes the Delaney brothers. There are some hilarious scenes as the adventure rolls along, but also moments of reflection and understanding. The plan derails quite spectacularly as violence, and some surprises, follow in its wake. Surprisingly the story ends on a positive note, and it reminds us that there is always hope. Well that was quite a journey. Younger brother Jake has a plan to repay a debt and against his first instinct Tim agrees to help him. What follows is part laugh out loud comedy and part tragedy and the many revisions to their plan made ‘on the hoof’ make for a journey full of adventure. Essentially it’s an examination of the relationship between the brothers and how it holds up under pressure and anyone with siblings will be able to relate. My thanks to the Borough Press for the ARC received via Well that was quite a journey. Younger brother Jake has a plan to repay a debt and against his first instinct Tim agrees to help him. What follows is part laugh out loud comedy and part tragedy and the many revisions to their plan made ‘on the hoof’ make for a journey full of adventure. Essentially it’s an examination of the relationship between the brothers and how it holds up under pressure and anyone with siblings will be able to relate. This book goes on a bit in the middle although the early and later chapters are good. The relationship between the brothers is well done. The story is s bit Wild West! Which is when his younger brother, Jake, turns up and things No Good Brother gets off to a leisurely start as we see the boat Tim crews on winding down after the herring season. You get a real sense of how important this boat is to the family business which operates it and how the crew works together like a family, whether they’re related by blood or not. Tim’s made himself invaluable as a crew member and is being coaxed into becoming a more permanent part of the actual family at the heart of it. The fourth novel by award winning author, Tyler Keevil, introduces us to the hapless Harding Brothers: Jake and Timothy (or Lefty and Poncho, to use their nicknames). The Hardings lost their sister, Sandy, to a Drunk Driver just as her Dancing career was taking off. The consequences of her death still casts a dark shadow on the lives of her surviving siblings and is the spark for a madcap agreement by Jake to steal a prize racehorse and smuggle it across the border from Canada to the USA. But nothing ever goes according to plan for the brothers as they struggle to honour a contract with a crime family, the Delaneys, who looked after Jake's back inside. The Brothers' ridiculous plans (well mainly Jake's) rapidly unravel and thereafter their antics are both farcical and humorous in this marvellous story as the brothers seek to overcome all odds (the weather and the legal authorities being but two) to deliver the goods. But the gangsters (the Delaneys) are none too happy about the publicity both Jake and Tim manage to attain along the way and thus when they meet up in America sparks are set to fly. And in amongst all this chaos is a failed romance which Jake hopes to rekindle. The title "No Good Brother" is an excellent description of the relationship between the two brothers: as no matter the emphasis, it fits Jake and Tim. Their loyalty to one another is incredible no matter what stupid thing the other has done. Their motto is "Family is Everything" and it provides the novel with its delightfully poignant ending. Including unexpected twists, turns, action and gaffes galore this is a highly readable novel by a very talented author. No Good Brother is a wonderful read. Tim is a deckhand on a fishing boat in Canada, just as the season ends his brother Jake turns up at the dock wanting Tim's help with a job, Jake is a drifter and has served a jail sentence, full of ideas that never pan out and now in debt to the notorious and vicious Delaney brothers, and economical with the truth when persuading Tim to help him. So starts an epic journey across land and sea with almost unbelievable moments of danger, slapstick comedy and path No Good Brother is a wonderful read. Tim is a deckhand on a fishing boat in Canada, just as the season ends his brother Jake turns up at the dock wanting Tim's help with a job, Jake is a drifter and has served a jail sentence, full of ideas that never pan out and now in debt to the notorious and vicious Delaney brothers, and economical with the truth when persuading Tim to help him. So starts an epic journey across land and sea with almost unbelievable moments of danger, slapstick comedy and pathos, these two endure no end of problems all of their own making plus a shed load of bad luck. This is a brilliantly executed story so well written, some real laugh out load moments and a few heartbreaking ones. As the story unfolds we learn of their tragic past and how it has shaped their life. But above all we learn a lesson of loyalty and family love. Whilst reading I could see it unfolding on a cinema screen in the style of the Cohen brothers films. 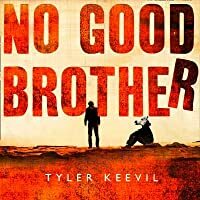 I thoroughly enjoyed No Good Brother - it had me hooked from start to finish, and as I approached the end I slowed down because I didn’t want it to be over too soon. It made me laugh out loud, and I also cried during one of the earlier chapters; I found the two main characters very absorbing and got easily carried away with their escapades. But what captured me most was the relationship between the two brothers. I have a younger brother myself, and much of what they go through in the novel is re I thoroughly enjoyed No Good Brother - it had me hooked from start to finish, and as I approached the end I slowed down because I didn’t want it to be over too soon. It made me laugh out loud, and I also cried during one of the earlier chapters; I found the two main characters very absorbing and got easily carried away with their escapades. But what captured me most was the relationship between the two brothers. I have a younger brother myself, and much of what they go through in the novel is recognisable to me as a sibling. I found this quite powerful - the storyline captures something about the sibling relationship that is both obvious and difficult to put into words; I think Tyler Keevil does this perfectly. One has served time in prison and owes the gang, that protected him while inside, a favour. They call in the favour and ask him to steal a racehorse from a Canadian stable and deliver it to the gang’s boss’ ranch in the United States. The story is told by the other brother - the good brother, and from page one we know we’re in for a fast-paced heist drama, where the big event has already happened. This story is expertly written by Tyler Keevil. Well drawn characters, a brilli Two Canadian brothers. This story is expertly written by Tyler Keevil. Well drawn characters, a brilliant story arc and short chapters making it a really user-friendly, gripping read. The good brother tells the story in hindsight and we watch as he gets pulled along on a heist that we want to go right, but keeps going wrong. The style is tight but not muscular. There are some tender and tearful scenes that really elevate this novel. We find out that the brothers older sister died and how the good brother feels responsible for his younger brother going bad. The last Tyler Keevil novel I read was his phantasmagorical road trip The Drive, which I hugely enjoyed. This is a different beast, one much more grounded in reality, but it's just as good a read. Our narrator is a fisherman, working a difficult but above board life until his brother, out of jail and involved with some gangsters, shows up needing his help....that's all the plot description you're going to get, because the twists, turns and reveals of the novel are half the fun. Basically, if you The last Tyler Keevil novel I read was his phantasmagorical road trip The Drive, which I hugely enjoyed. This is a different beast, one much more grounded in reality, but it's just as good a read. Our narrator is a fisherman, working a difficult but above board life until his brother, out of jail and involved with some gangsters, shows up needing his help....that's all the plot description you're going to get, because the twists, turns and reveals of the novel are half the fun. Basically, if you like Bruce Springsteen's Nebraska album, you're going to love this. It captures that same sense of hardscrabble lives, of trying to live the best you can under impossible circumstances. One of the epigraphs at the beginning is from the song Highway Patrolman, and it's perfect for this tale of brotherly loyalty trumping the sensible and safe, frankly better, alternatives. Sometimes it's sad, sometimes it's (darkly) funny, sometimes it's unbearably tense, but it's always very very readable. struggled with this book at first as it was depressing and bleak at the beginning, as were the lives of Tim and Jake. What follows does lighten the tone of the book as we are introduced struggled with this book at first as it was depressing and bleak at the beginning, as were the lives of Tim and Jake. Read the first couple of chapters or so, decided to flip to end, read last chapter or so & decided not to read the rest of the book. I was drawn to the book because of its west coast connection, and fishing, but the story just didn't grab me enough to persist. It certainly touched on a lot of challenging relationship issues. Maybe another time I might have seen it differently, but not today. I haven't read any of the author's previous books. What a couple of haywire, loveable characters!! A very well written and quite enjoyable story. It was cool that the setting took place in the Vancouver area and I recognized so many names and places. I really enjoyed this stories of brothers! It was fast paced and entertaining. Tyler was raised in Vancouver, Canada. He first came to the UK in 1999 to study English at Lancaster University. He returned home to finish his degree, and after graduating undertook a variety of bizarre jobs, working as a treeplanter, a landscape gardener, a deckhand on a fishing barge, a ‘greenhorn’ in the shipyards, a restaurant busser and a kayak shop assistant. After paying back his student l Tyler was raised in Vancouver, Canada. He first came to the UK in 1999 to study English at Lancaster University. He returned home to finish his degree, and after graduating undertook a variety of bizarre jobs, working as a treeplanter, a landscape gardener, a deckhand on a fishing barge, a ‘greenhorn’ in the shipyards, a restaurant busser and a kayak shop assistant. After paying back his student loan, and saving up some money, he moved to Prague to try his hand at being a starving writer – the only problem being that he didn’t know how to write yet. The money ran out before he learned, and after a brief stint living in Birmingham, he moved to Wales in 2003. While working part-time cleaning toilets at a petrol station, Tyler committed to learning the craft, and after picking up a handful of short fiction awards – including a Writer of the Year Award from Writers Inc. of London – he began selling his stories to magazines. He is interested both in literary and slipstream fiction, and has been published in New Welsh Review, Planet, Transmission, Dream Catcher, Black Static, and On Spec, among others. A translation of his story, ‘Masque of the Red Clown’ has also recently been commissioned by the French-Canadian magazine, Solaris. Tyler has also written for the screen; a short film he wrote recently aired on ITV Wales, whilst another picked up the Welsh Dragon Award at the Newport International Film Festival. Welsh editors have always been supportive of his writing, from Arthur Smith to Dafydd Prys to Francesca Rhydderch to Helle Michelson, and now more recently Lucy Llewellyn at Parthian. Like most Canadians, Tyler enjoys his winter sports, including hockey and snowboarding, but since coming to Wales he has discovered the wonders of hiking and camping – particular along the Pembrokeshire coast. He currently works part-time in a factory near his hometown of Llanidloes, and lectures in Creative Writing at the University of Gloucestershire.